The most common symptoms of blocked drains are sulphurous smells from rotting materials, slow draining sinks and overflowing or gurgling toilets, sinks or showers. However, it is important to note that if just one of your outlets has stopped flowing, for example just the sink or bath, then it more likely that your U bend or other pipe has a blockage, rather than a problem with your drains. Blocked sinks are the easiest to clear as the U bend can easily be found under the sink. If the U bend is blocked by a build up of vegetable matter or other waste materials, simply unscrew the joints to the U-bend and clear the blockage manually. If the blockage is not too bad, a plunger may work too. If the problem is not easily solved by unblocking the U bend, then it’s time to roll your sleeves up and tackle the drains! Most drain cleaners contain sodium hydroxide (aka caustic soda) or lye. These are nasty chemicals which can cause irritation and chemical burns if you are not careful and can also facilitate combustion in certain circumstances. The best way to unblock drains without caustic chemicals, is by using a plunger, drain cleaning rods or a mechanical drain snake. These methods all require a little elbow grease when compared to simply pouring chemicals down the drain, but they usually produce better results than most chemical cleaners. If your drain is clogged up badly, the best DIY option is to use a set of drain cleaning rods, however you need to be careful not to force too much as it could damage your plumbing. Drain cleaning rods can be purchased from your local Hardware or DIY store for under £20, but to use them safely, you will also require a pair of protective rubber gloves and eye protection. To begin unblocking drains, you first need to identify the correct man0hole cover to get access. Once manhole cover has been removed, assemble two or three rods along with the rubber disk and insert slowly into the drain in the direction of the property (i.e away from the street). 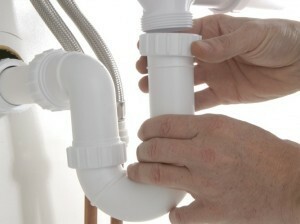 When the rod is inside the drain, take care that you never rotate counter clockwise, as this could result in the unscrewing of the rods or the rubber disk which will totally block the drain and you will then require a drainage professional to unblock the drains and recover the draining rods – expensive and embarrassing! With the rubber disk and rods in the drain, pull the rods out very quickly to start the drains flowing, if the drains do not flow immediately, add more lengths of rod and try again. Prevention is always better than the cure. So to avoid blockages in the future and keep your pipes healthy, flush your drain weekly with boiling water and use a plug-hole filter to prevent materials entering the pipeline in the first place. If you are unsure about cleaning blocked drains yourself, then use “Post Your Job” on our site to gather quotations from 3 local drainage experts in your area.